A new study has found that US states in which police officers are allowed to pull over a driver for texting saw fewer deaths than those without such policies. If you live in a state in which police officers are allowed to pull over drivers caught texting, you may just be a little bit safer than the norm. Researchers at the University of Alabama at Birmingham School of Public Health studied the effects of texting-while-driving laws on roadway crash-related fatalities and published their promising findings in the August issue of the American Journal of Public Health. According to lead author Dr. Alva O. Ferdinand, some states have banned all drivers from texting while driving, while others have banned only young drivers from this activity. Further, in some states, an officer must have another reason to stop a vehicle, such as speeding, before he's allowed to issue a texting ticket. "Very little is known about whether laws banning texting while driving have actually improved roadway safety," Ferdinand said. "Further, given the considerable variation in the types of laws that states have passed and whom they ban from what, it was necessary to determine which types of laws are most beneficial in improving roadway safety." The results of the study showed a three percent reduction in traffic fatalities among all age groups, said Ferdinand, but the results among younger drivers was the most dramatic. 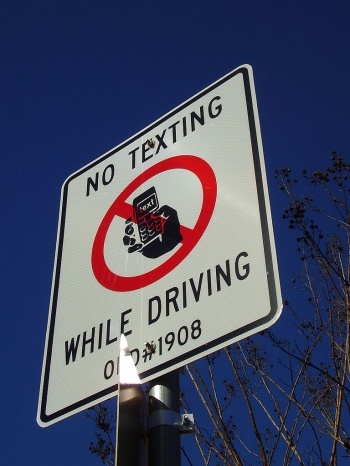 "Primarily enforced texting laws that banned only young drivers from texting were the most effective at reducing deaths among the 15- to 21-year-old cohort, with an associated 11 percent reduction in traffic fatalities among this age group in states with such bans." As for older drivers, banning handheld devices altogether is what showed the best results. "We were a little surprised to see that primarily enforced texting bans were not associated with significant reductions in fatalities among those ages 21 to 64, who are not considered to be young drivers," Ferdinand said. "However, states with bans prohibiting the use of cellphones without hands-free technology altogether on all drivers saw significant reductions in fatalities among this particular age group. Thus, although texting-while-driving bans were most effective for reducing traffic-related fatalities among young individuals, handheld bans appear to be most effective for adults." Are you guilty of texting while driving? Do you agree with texting or handheld bans?